At Trillium Dental, our dentists and dental hygienists are sensitive to the fact that not everyone loves visiting their local dental clinic for teeth cleanings, dental x-rays, and cavity fillings. That’s why we offer sedation dentistry options to help put patients at ease, including IV sedation, oral sedation, and nitrous oxide. 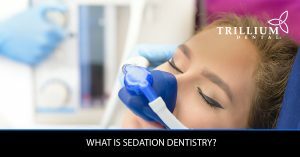 In our sleep dentistry blog, you’ll find information about sedation dentistry, as well as how patients can relax with dental sedation and how to overcome your fear of anesthesia. Whether you’re looking to ease anxiety during your next dental exam or you have an upcoming dental procedure that requires sedation, such as wisdom teeth removal, we’ve got you covered. Contact us to book a dental appointment in Ottawa! Sedation Dentistry Part One: What Are My Options?